WHAT AN EVENT! This is a panoramic view of the dinner. Prior to the dinner we were encouraged to submit our bids on 88 donated silent auction items. Many came from Denver area establishments and we also had some brought from the Philippines. During the review we were offered several scrumptious appetizers, with a variety of drinks to quench our thirst. There were close some 400 guests who enjoyed an excellent catered dinner. 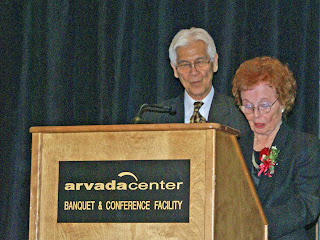 After the dinner we honored Exempla Healthcare, Betty O’Belmito and Jonathan Savelle as recipients of Uplift Internationale’s 2008 Humanitarian Awards. There were several live auction items that were sold, including a superb painting by Jaime Yrastorza and a beautiful handmade Sumas silk rug.